Currency (a) 27 BC - AD 212: 1 gold aureus (1/40 lb. of gold, devalued to 1/50 lb. by 212) = 25 silver denarii = 100 bronze sesterces = 400 copper asses. 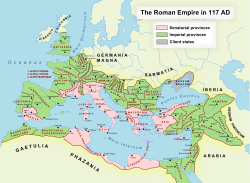 * These events marked the end of the Western Roman Empire (286–476) and of the Eastern Roman Empire (330–1453), respectively. Ilẹ̀ Ọbalúayé Rómù (Roman Empire) tabi Ile Romu ni igba eyin toloselu to sele ni Romu Atijo, to je ti ijoba oseluenikan to ni agbegbe kakiri Europe ati yipo agbegbe Mediterranean. Oro yi bere si je lilo lati juwe ile ijoba Romu nigba ati leyin obaluaye ibe akoko Augustus. ↑ Constantine I (306 - 337 AD) by Hans A. Pohlsander. De Imperatoribus Romanis. Written 2004-1-8. Retrieved 2007-3-20. ↑ 2.0 2.1 2.2 2.3 Taagepera, Rein (1979). "Size and Duration of Empires: Growth-Decline Curves, 600 B.C. to 600 A.D.". Social Science History 3 (3/4): 125. doi:10.2307/1170959. http://links.jstor.org/sici?sici=0145-5532%281979%293%3A3%2F4%3C115%3ASADOEG%3E2.0.CO%3B2-H.
↑ "Roman Empire -- Britannica Online Encyclopedia". www.britannica.com. Retrieved 2008-07-09. Reid, T.R. (1997). "The World According to Rome". National Geographic 192 (2): 54–83. http://ngm.nationalgeographic.com/. Sadao Nishijima. (1986). "The Economic and Social History of Former Han", in Cambridge History of China: Volume I: the Ch'in and Han Empires, 221 B.C. – A.D. 220, 545–607. Edited by Denis Twitchett and Michael Loewe. Cambridge: Cambridge University Press. ISBN 0-521-24327-0. Àtunṣe ojúewé yi gbẹ̀yìn wáyé ni ọjọ́ 25 Oṣù Kẹjọ 2014, ni ago 20:20.